The power of next generation sequencing is allowing us to gain a better understanding than ever before about how bacteria spread. We are interested in the role that urban livestock keeping plays in the spread of E. coli in low-income areas of Nairobi. Our analysis includes bacterial samples collected through many strands of the Urban Zoonoses project, from humans, livestock, food, wildlife and the environment. We are using state-of-the art methods for integrating bacterial genetic sequence data with information about the time, location and host from which the bacteria were sampled. 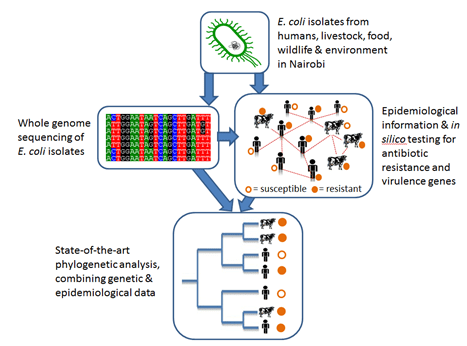 By combining epidemiological and demographic information with the genetic data, we will be able to understand the E. coli diversity within Nairobi, and how this differs across socioeconomic groups, in different housing types and in relation to livestock keeping practices. From the bacterial genome sequences we can also look for genes of interest, such as those conferring bacterial virulence or resistance to antibiotics. By examining the set of genes carried by bacteria from different individuals, hosts or locations, we can make inferences about reservoirs of antibiotic resistance and pinpoint potential hotspots for disease outbreaks or the emergence of new pandemic strains.